The original Stout Metal Airplane Company was purchased in 1925 by Henry Ford and the new division of the Ford Motor Company produced three versions of the Tri-Motor monoplane. The Tri-Motor’s fuselage was constructed from a series of transverse duralumin bulkheads covered with corrugated metal skin. One engine was mounted in the nose, while the other two were suspended underneath the wings. In 1926 Ford told Stout to build him a tri-motor. Stout rushed through his Model 3-AT and the resulting Model 3-AT was a crude and unimpressive lash-up. It may have flown only once before it was destroyed in a fire on the ground, which also destroyed the factory at Ford Airport, on 17 January 1926. Ford and Stout had a violent argument which ended in Stout being fired. In February 1926 Ford decided to proceed with an improved aircraft, the Model 4-AT, whose design was based on that of the Model 3-AT but differed in almost all details and especially in the engine installations, cockpit, landing gear and fuselage. The small engineering team was headed by Harold Hicks and Tom Towle. The first of the successful Ford tri-motors, NC1492, was flown for the first time on 11 June 1926. The wing was recessed so that the three spars significantly reduced headroom in the cabin. Each spar was a Warren-braced truss assembled mainly by riveting, and the ribs were likewise built up from rolled strip and sections. The wing suffered a certain amount of cracking after flying over 5,000 hours. The wing was made in three parts, the rectangular centre section being integral with the fuselage. The latter was a capacious box. The three engines, which in the Model 4-AT were 149-kW (200-hp) Wright J-4 Whirlwinds driving two-blade metal propellers, were uncowled and in most Fords not even provided with cooling airflow baffles or fairings. In the Model 3-AT the nose engine had been mounted low to balance the thrust lines of the two wing-mounted engines, but in the Model 4-AT the centre engine was mounted exactly on the nose and the other pair brought down so that all thrust lines were at the same level, the wing engines now being carried on the front of separate strut-mounted nacelles well below the wihg. The wing engines had short stub exhausts or, from 1927, an exhaust manifold leading to a short pipe on the outboard side of the nacelle. The nose engine, how-ever, sent its gas through a pipe running (in most versions) half way back to the tail, surrounded by a muff open at the front so that, in cold weather, heated fresh air could be admitted to the cabin. The movable control surfaces, as well as the fixed tail, were metal-skinned. The extreme nose and the top and bottom of the fuselage were often skinned with smooth metal sheet. From the first Model 4-AT, the skin material used was Alclad, duralumin coated with non-corrosive pure aluminium, spray coated in varnish. All the Fords had an oval entrance door on the right side, used for passengers, cargo and also by the two pilots. In the Model 4-AT the latter had the usual open cockpit, a feature of which was a sharply angled Vee windshield with glass panes that were not vertical but sloped outwards from bottom to top, to give a better view for landing. Panels in the windshield could be slid open in really bad weather. The Model 4-AT had four passenger seats on each side of a central aisle, and was available with a lavatory at the rear. Light personal baggage could be placed in a typical suspended-mesh rack along each side of the cabin above the windows, level with the bottoms of the wing spars. In a few Model 4-ATs further baggage and mail was stowed in drop-down lockers between the spars at the inner end of each outer wing panel, though this was really a feature of later models. Other features were wheel brakes, which enabled a tailwheel to be used instead of a skid, and an electrical system with the battery charged by a generator on the nose engine. This system served navigation lights and, in most aircraft, leading-edge landing lamps and two-way radio. On the other hand, the Fords adhered to the old practice of running the tail control cables along the outside of the fuselage from large rocker arms on the sides of the nose. One of the first customers was Stout Air Services to fly schedules from Detroit to Chicago and other cities in the Great Lakes region. Thirty-seven of the 1928 4-AT-B were built, powered by three 220hp Wright J-5, under certificate 2-10 (later replaced by 87). One went to the AAC as C-3 (NC3444 / 28-348), 7 as C-3A/-9 (29-220-226), 1 as -4, and 4 as C-4A. All C-3A were later converted to C-9 repowered with 300hp Wright R-975s. Several civil models were converted to 4-AT-E in 1930-31. One 4-AT-C was built, NC7862, in 1928 (ATC 2-11). Sold to Sunbeam Air Transport, it crashed on 1 December 1928. The 1928 4-AT-D (ATC 2-322) was a special long-wing model with three 220hp Wright J-5. Sold for $48,000, the one built went to Grand Canyon scenic flights as NC5578, then to Ecuador in 1945 as HC-SBC. There was also one conversion from an 4-AT-B, NC7583, and reportedly one other, NC7586. Four (A8457, A8598-8599) from civil 5-AT-C went to the USN/USMC as JR-3/RR-3. (ATC 2-240) and (ATC 2-242) for 15 passengers with 420hp Wasp as 5-AT-C Special (A8840). Twenty-five of the 1929 4-AT-E (ATC 132) were built, selling for $42,000. Some were 4-AT-B conversions. Seven went to the AAC as C-3A, and two to USN as JR. One as the XJR-1 (A7526) and five production model as the JR-2 (A8273-8274), re-designated as RR-2 later. The single 4-AT-F (ATC 441) built, 9656, in 1931, went to Spain with three eventual registrations: EC-BAB, EC-RRA, and EC-WIO. Subsequent Fords had an enclosed cockpit with sliding side windows, and various other refinements, and almost all were more powerful. As listed in the separate variants section, there were almost as many sub-types as there were aircraft built, partly because there were numerous rebuilds and conversions. The initial Model 4-AT-A eight-seater entered service with Ford’s own air service on 2 August 1926. Ford Airport at Dearborn had by this time become the first in the world with paved runways and full electric lighting, and later Ford not only made other improvements to the buildings but also set up one of the world’s first training schools for commercial flight crews. Though the Model 4-AT had been the biggest all-metal aircraft then built in the USA, and possibly in the world, it was rightly judged too small and the Model 4-AT-B of 1927 had a span increased from 20.97m (68ft l0in) to 22.53m (73ft 11in), matching the greater power of 164-kW (220-hp) J-6 Whirlwind engines. Though the fuselage was almost the same as before, the seating limit went up to 12. There followed various sub-types of Model 4-AT, differing chiefly in engine arrangement. Almost all the Fords were originally built with spatted main wheels, and their modern image did much to promote sales. When the Ford was a new and very modern aircraft, most had Wright engines in the 149/164-kW (200/220-hp) bracket, but produc­tion of this Model 4-AT family came to an end (except for the single Model 4-AT-F) in 1929. By this time the much more powerful, and further enlarged, Model 5-AT family was selling even better than its predecessors, and output of Model 5-ATs reached a remarkable four per week in 1929, before the Wall Street crash. Thanks to the use of the Pratt & Whitney Wasp engine, the Model 5-AT was a much more capable aircraft. First flown in mid-1928, the Model 5-AT had a further enlarged wing, the fuselage deepened to give more headroom under the wing, Townend-ring cowled wing engines (often a cowled nose engine also), and a structure streng­thened for operation at greater weights. The 1929 5-AT-A (ATC 2-32, 2-282) sold for $65,000. Three were built, one to P&W Co [NX/NC6926], and two to Northwest Airlines [NX/NC7416, NC7739]. The 1929 5-AT-B (ATC 156) had 17-19 passengers and sold for $55,000. Forty-two were built, of which one went to the AAC as C-4. C/n 11, started with PAA in 1929, and ended up at the San Diego Air Museum in 1982. It had 13 US and Central American registrations: NC9637 / NM22 / XA-BCC / AN-AJJ / HI3 / NX1629M / N1629M / XB-KUI / XA-HIL / N1629M / N9637 / N76GC / N9637. ATC 2-12 was for modification to 14passenger with 420hp P&W Wasp C.
The 1930 5-AT-C (ATC 165) was an improved 5-AT-B as "De-Luxe Club Model" with increased performance, cowlings and wheel pants options. Selling for $55,000-68,000, fifty-one were built. One, NX9652, was heavily modified in April 1931 as XB-906-01 for AAC five place bomber evaluation, built at the firm’s expense and using what was mainly a Model 5-A T-D airframe (but with a redesigned vertical tail). First flown on 27 June 1931, it crashed during dive testing at the factory on 19 September 1931. There were guns above and below at the rear and a bombardier’s station under the cockpit. Four went to the USN/USMC as JR-3/RR-4. (ATC 2-240) and (ATC 2-242) for 15 passengers with 420hp Wasp as 5-AT-C Special. Tri-motors nos 69, 74 and 75 (NC410H, NC414H, NC415H) were all of the 1930 Model 5-AT-CS (ATC 296, 2-518) type with twin floats for water-based operation, sold for $68,000. In 1930 one 5-AT-C, NX/NC420H, was modified with one 450hp P&W + two 220hp Wright J-5 mounted on the leading edge of the wings as a 5-AT-E. It was restored as a 5-AT-C in 1930. Twenty 1931 5-AT-D (ATC 409) were sold for $50,000. Four went to the AAC as C-4A, and two to the USN/USMC as RR-5 (9205 & 9206). The single 1935 5-AT-DS built, (ATC 2-504) NC/NR9657, was powered by three 450hp P&W Wasp. 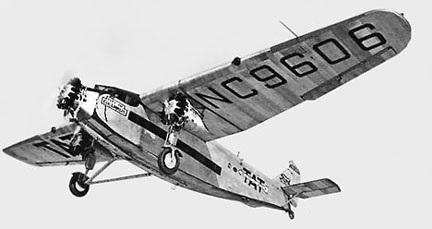 The 1929 6-AT-A (ATC 173, 2-97) was as a 5-AT-C with 16 passenger seats and three 300hp Wright J-6. Selling for $50,000, or $92,650 on floats, 2 were built. One, NC8485, was converted first to a 7-AT, then 5-AT-C. One went to Colonial Air Transport as NC8486. Both went to China in 1936. No fewer than 117 Model 5-AT were built in 1929-31, many were built with the wing baggage/mail lockers, and others were thus equipped as a modification. The cabin could be equipped to seat up to 17, with eight seats on the right and nine on the left, even with a rear lavatory.Northwest Airlines took delivery of the 5-AT in September 1927, costing $55,000 each. 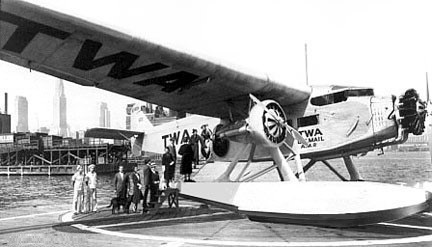 The sole 6-AT-S (ATC 2-80), built in 1929 with 12 passenger seats and on Brewster floats, went to Canada as a forest sprayer (G-CYWZ / CF-BEP). Converted to a landplane, it was destroyed in 1939 when a RCAF Hawker Hurricane ran into it while taking off. One 7-AT(ATC 246) was built, in 1929 as NC8485, as a 16 passenger 6-AT-A with one 420hp P&W Wasp + two 300hp Wright J-6. It was modified with three 300hp Wright J-6 for entry in the 1929-30 National Air Tours (p: Myron Zeller). Final conversion was to 5-AT-C with three 450hp Wasp and delivered to American Airlines in 1931. Exported to China in 1936. In 1930 one 4-AT-B (X/NC7585/NC423H) was converted to the 9-AT-A (ATC 307) powered by three 300hp P&W Wasp Jr. Sold for $40,000 it went to Honduras in 1934. In 1931 temporarily designated 4-AT-G, the 14 place11-AT (ATC 441) was powered by three 225hp Packard DR-980 diesel engines. The one built (NC/NX/NR8404) was modified in 1934 to-AT-B with 220hp Wright J-5 engines. It crashed in March 1937 and was sent to Parks Air College for rebuilding, which proved infeasible due to the extent of damage. In 1931 one 5-AT-D was modified as the eight place 13-A (ATC 431) powered by one 575hp / 429-kW Wright Cyclone and two 300hp Wright J-6. It was converted for the 1931 National Air Tour, then converted back to a 16-place 5-AT-D in 1932 (under ATC 209), and sold to Panagra (NX/NC433H). Total population of all Ford tri-motors from 1926-33 was 198, plus a few special-purpose modifications and experiments. 7-AT-A - rebuild of Model 6-AT-A with a nose-mounted 313-kW (420-hp) Wasp radial. 9-AT - conversion of Model 4-AT-B with 224-kW (300-hp) Wasp J union radials; 1 converted. 11-AT - one Model 4-AT-E rebuilt with 168-kW (225-hp) Packard DR-980 diesels. C-3 - US Army no, 28-348, based on Model 4-AT-B. C-3A - US Army nos 29-220/226, seven aircraft with 175-kW (235-hp) R-790-3 Whirlwind radials. C-4 - US Army no, 29-219, basically a Model 4-AT-B for military service. C-4A - US Army nos 31-401/404, four aircraft based on the Model 5-AT-D with 336-kW (450-hp) R-1340-11 radials. C-9 - redesignation of all seven C-3As after the installation of 224-kW (300-hp) R-975-1 radials. XJR-1 - US Navy no, A7526, based on Model 4-AT. JR-2 - US Navy nos A8273/8274, two aircraft based on the Model 4-AT-E for the US Marine Corps. JR-3 - US Navy nos A8457 and A8598/8599, three aircraft based on the Model 5-AT-C.
RR-2 - redesignation of JR-2. RR-3 - redesignation of JR-3. RR-4 - additional Model 5-AT-C with US Navy no, A8840. XB-906-1 single prototype 1NX96521 for a bomber version with internal racks and two gunners positions; crashed on 19 September 1931 killing Ford’s chief test pilot, Leroy Manning. Max level speed: 134 mph (214 kph). Engines: 3 x175-kW (235-hp) R-790-3 Whirlwind radials. Normal range 708 km (440 miles). Max takeoff weight 5738kg (12,650 lb). Passengers, 15 (later) 13 plus steward, or 1520 kg (3,350 lb) cargo. Engines: 2 xJ-6 Whirlwind, 300hp and 1 x 313-kW (420-hp) Wasp radial. Engines: 3 x 224-kW (300-hp) R-975-1 radials.